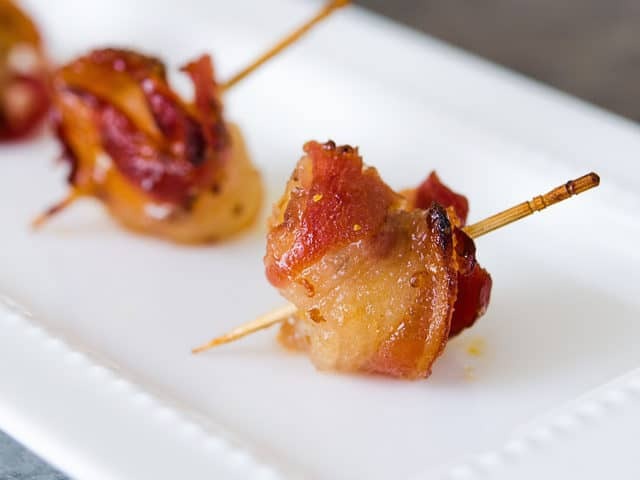 These Bacon Wrapped Water Chestnuts are a delicious one-bite appetizer that’s always a hit at parties. They’re crunchy, savory, salty, and meaty! This recipe is proof that some of the simplest things are also the most delicious. Only 4 ingredients are involved here, but there are so many different flavors and textures going on. What’s funny about this recipe is that I ate probably a thousand of these growing up, but I had no idea that they have a special name. Many people refer to Bacon Wrapped Water Chestnuts as Rumaki, though there’s quite a bit of variation in how people prepare it. The version I’m sharing today is how my mom made them when I was a kid. Bacon water chestnuts were one of her party staples, and people always raved. And I always wanted to eat the entire tray before the guests arrived, hah. What’s nice about these is you can assemble them in advance and store them in the fridge, then pop them into the oven before you want to serve. I love make-ahead appetizers! 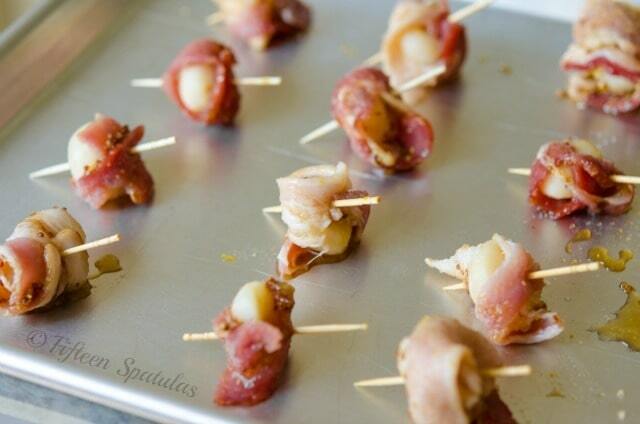 Then wrap each half bacon slice around individual water chestnuts, and secure with a toothpick. 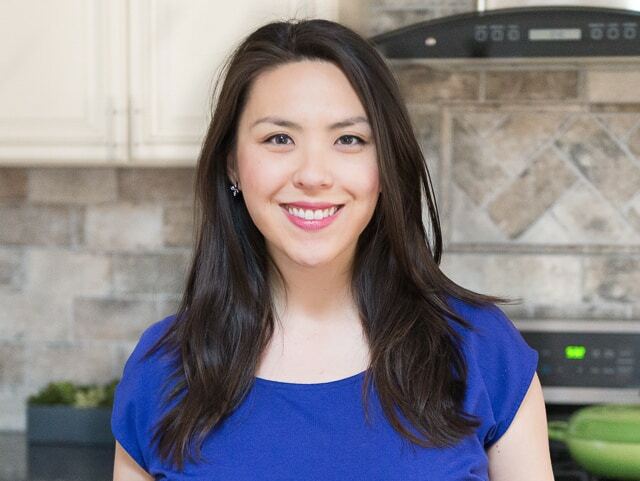 At this point, you can either bake them right away, or if you want to make the bacon wrapped water chestnuts ahead of time, you can store them in the fridge for several hours. Bake them fresh about 30 minutes before you want to serve them. Can Bacon Wrapped Water Chestnuts be reheated? Yes, re-warm in a 300F oven for about 10 minutes, until the bacon is crispy again. Can they be frozen? Canned water chestnuts sadly do not freeze very well, so I don’t recommend it. 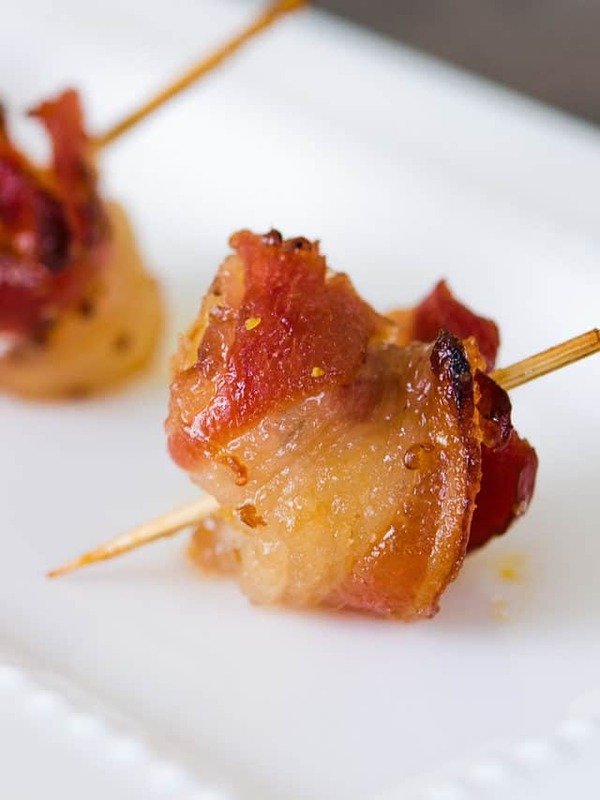 These delicious one-bite appetizers are always a hit at parties. They're crunchy, savory, sweet, salty, and meaty! Soak some toothpicks in water as you prepare the other ingredients so they don’t burn in the oven. 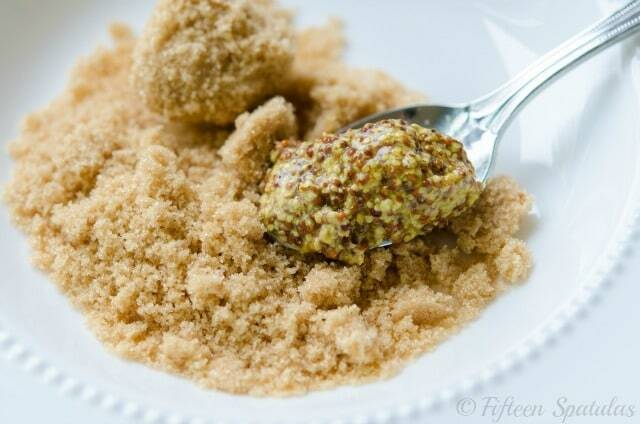 Mix together the brown sugar and mustard until combined. Set aside. 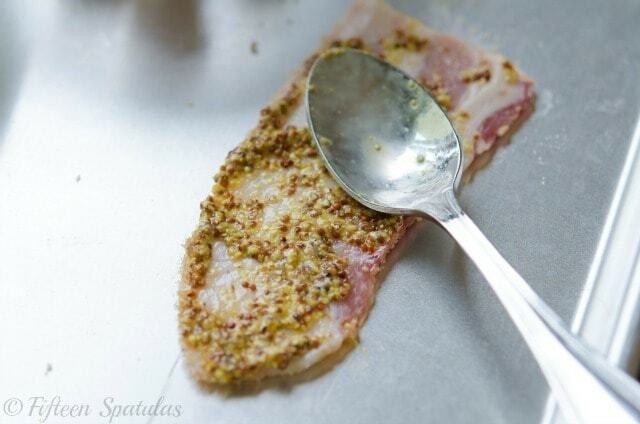 Cut the bacon strips in half (right in the middle), and spread evenly with the brown sugar and mustard. It's okay if it's a little messy. 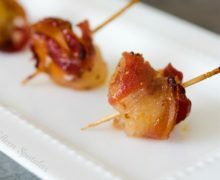 Wrap each water chestnut with a half bacon strip and roll it up, securing the bacon with a toothpick. Place all of the bacon wrapped water chestnuts onto a baking sheet and roast for 20 minutes, until the bacon has cooked through and the brown sugar has caramelized. Serve and enjoy! *Look for the biggest water chestnuts you can find. Look for words like “jumbo” or “fancy” on the can. Post updated with more tips and writing in July 2018. Originally published May 2013. My question is about the bacon grease. Does it help to line the baking sheet with foil that has small holes for grease to drain down onto? Hi Jackie, if you want the fat to drain I would use a rack instead, but foil with holes would work too. Enjoy! I have never been a fan of water chestnuts – I think it’s a texture thing. Though, I always say anything with bacon is better – completely changing my view on the water chestnut! My mom’s version has chicken livers but yours are even better!!! perfect starter!! this is great! These were a hit at my dinner party! My husband especially loved this recipe because it does not have the large amount of sugar and ketchup that we don’t care to cook with. Thanks so much!